The Federalist Party was one of the first two political parties in U.S history. During the administration of President George Washington, Alexander Hamilton, the first Secretary of the Treasury, gained followers for his fiscal policies. Hamilton and his associates, typically urban bankers and businessmen, then formed the Federalist Party to promote their shared political ideas. Federalists believed in a centralized national government with strong fiscal roots. In addition, the Federalists felt that the Constitution was open for interpretation. In other words, Federalists believed that there were unmentioned rights belonging to the federal government, and therefore the government had the right to adopt additional powers. Hamilton’s primary concern was the economy; he supported tariffs, a solid relationship with Great Britain, and, above all, a national bank. His banking policies came together with the formation of the Bank of the United States. The purpose of a national bank was to provide loans to businessmen to give them a reason them to invest in industry. At the time, the United States had an agricultural economy, while England and France were industrialized. The Federalists sought to diversify the economy so that the country could compete with these European powers, and the loans promoted business. As well, the bank was responsible for controlling inflation by limiting the amount of money that the federal government issued. This created both a stable currency and encouraged investment. Hamilton believed that only the wealthiest and most educated white men should govern the country. He feared that working-class citizens would be corrupted by greed if they were to be responsible for finances. This was one characteristic that influenced the Federalists to mold themselves after England. The other was the aforementioned desire to become industrialized. John Adams was the only Federalist President. George Washington never joined a political party, but his decisions while president usually favored the Federalists. The party ceased to exist at the end of the War of 1812. Numerous Federalists opposed the war because many of these men earned their living through trade. The conflict hampered the Federalists' ability to exchange with England. Tensions increased so much so that by 1814, some Federalists in New England threatened to secede from the United States to form their own country unless the American government immediately sought peace. With the signing of the Treaty of Ghent in 1814 and the end of the War of 1812, many Americans viewed the Federalists as traitors. The Federalist Party collapsed, leaving the Democratic-Republican Party as the only political party in the United States until the mid-1820s. The Federalist Party was the strongest political party in the Northwest Territory prior to statehood. 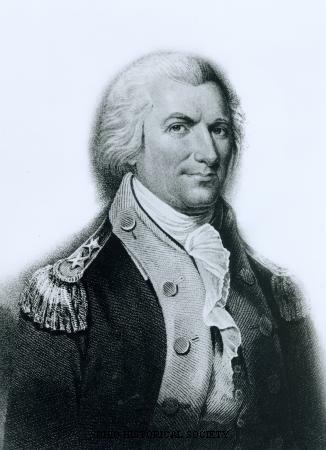 Arthur St. Clair, governor of the Northwest Territory, actively sought to secure Federalist dominance of the government. For example, he felt that Ohio should be split into two states, that way the Federalists dominated both. By 1803, the Democratic-Republican Party, however, had emerged as the dominant force in the Ohio government. This is evident in the Ohio Constitution of 1803, which established a relatively weak government, with the legislative branch holding most of the power. Most of Ohio's earliest political officials were Democratic-Republicans, including Thomas Worthington, one of Ohio's first two United States senators.